Hello! Here we go with WHY IT WORKS Mondays! Here's a room that I saw way back and just dug out recently. It's amazing how good design is timeless. This room was published in House and Home back in 2009. I know only 2 years ago, but the colors and ideas remain just as fresh today. Here's the break down. Color Palette. Man, isn't this room just plain beautiful to look at? That framed textile is just gorgeous! Lines. Notice how the lines of the couch, side chair and table are curvy and "light". Nothing big, square or bulky. 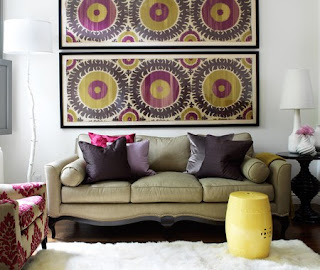 It plays off the circles of the artwork and makes the whole room feel light and playful. Pops of color. Notice how the colors in this room just dance around. A splash of yellow in the garden stool, some magenta in the side chair, lovely colors in the throw pillows and all nicely balanced out with a creamy white rug, lamp and accessories. Framed textile or paper as artwork. I love this idea! There are so many beautiful fabrics and papers out there. There's a print and color palette for everyone. Frame it up and you add instant graphic punch to a space. Best thing, you put it together yourself, so it's one of a kind! White lamps. The lamps in this room are interesting. They almost fade into the background and you hardly notice them. It allows the artwork and furniture to pop into the foreground. Maybe try this same technique in your space. Throw pillows. Boy, sometimes placing throw pillows on a couch or a bench can seem like putting together a work of art in itself. There's a fine balance between too much and too little. I like this arrangement that they have. 3 on one side and 2 on the other. All coordinating solid colors. Nice. To see more photos of Emily Walker's charming home, click here.